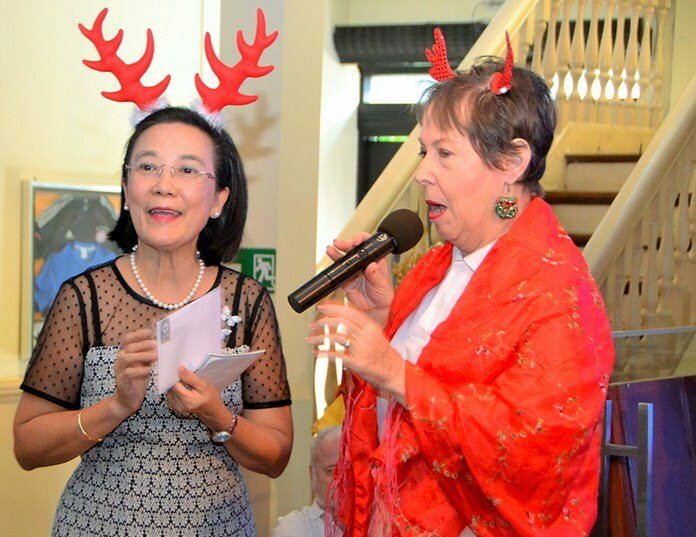 Sunday, December 18, was the Pattaya City Expats Club’s annual Christmas Program. 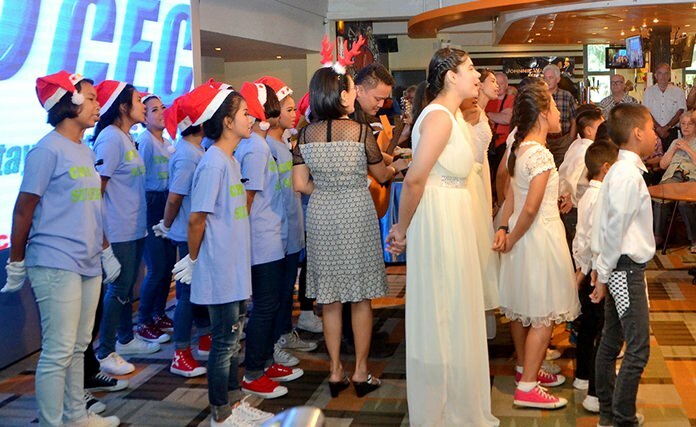 Unlike previous years, there was no children’s choir from Pattaya Orphanage singing Christmas carols or a jolly fat man in a red suit and white beard to hand out presents donated by PCEC members and guests. This was the result of the recent passing of His Majesty the King and the Orphanage’s decision to not have a choir singing Christmas carols. Club member Judith Edmonds presents Toy with cash donated by PCEC members and guests and mentioned that in addition there were several gifts for them to take back to the Orphanage. 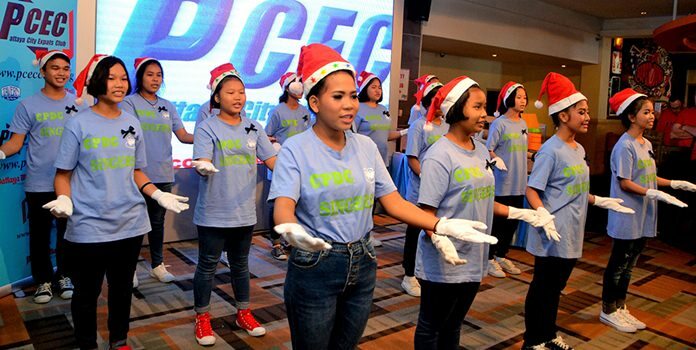 But Radchada (Toy) Chom­jinda from Pattaya Orphanage was on hand to introduce several of the children from the Orphanage and the Child Protection Development Centre (CPDC); they entertained the audience with some classical Thai dances and sang a few songs in English. Toy said that she could not find the words to express her gratitude for the support the Pattaya Orphanage has received from the PCEC in what has been “a very difficult year.” She was referring not only to the death of HM the late King of Thailand, but also to other events across the globe, including the war in Syria and the difficult economic environment. The first dance was performed by four girls. It was followed by a solo dance performance by the girls’ dance teacher. The girls and their teacher were dressed in classical Thai costumes. Then a number of singers came out from the CPDC, wearing large white gloves which they used to great effect as they performed. They were followed by children the Orphanage dressed in white. The children sang three songs: (1) “We Are the Children of Yesterday’s Dream”; (2) “Thank You Very Much,” from the musical “Scrooge”; and (3) “So Long, Farewell,” from the musical “The Sound of Music.” They also performed a rousing rendition of “We Wish You a Merry Christmas” at the end of their performance. PCEC Member Judith Edmonds, who organized the collection of donations during the preceding weeks, presented a large cash donation to Toy, and promised that there would be more cash to come when final donations were received. She also presented Toy with a large volume of gifts for the children. It took several strong “able-bodied” men to carry the boxes of gifts to the orphanage van. 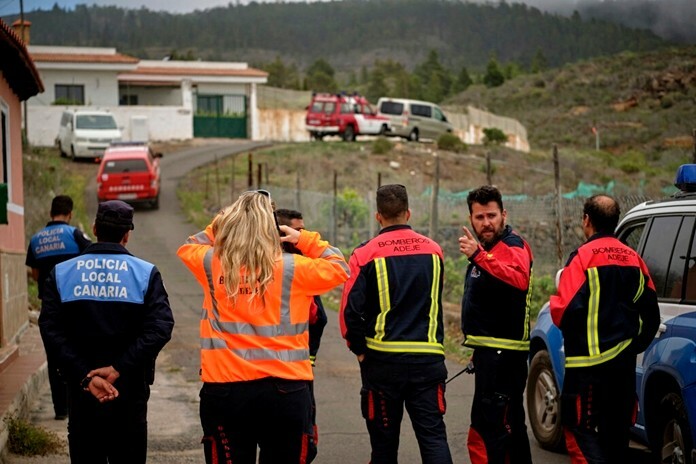 The gifts included much-needed items like clothes and toiletries. With subsequent donations, the total raised for gifts and cash donation was 89,300 baht. Prior to the start of the PCEC meeting, Toy and the children posed for members and guests to take pictures. After Toy and the children left the stage, Member Roger Fox led the PCEC Choir (i.e. the people in the audience) in rousing renditions of a number of Christmas carols, including standards such as “Joy to the World,” “Jingle Bell Rock,” and “Deck the Halls.” Well, okay, not all of the renditions were rousing. 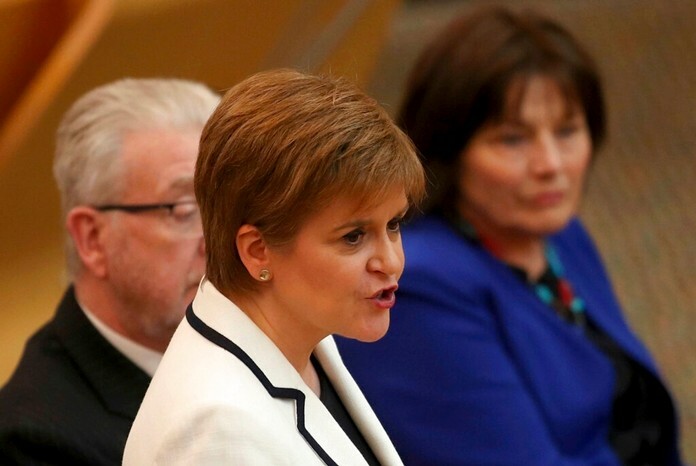 But, after all, the “choir” didn’t have a chance to rehearse. 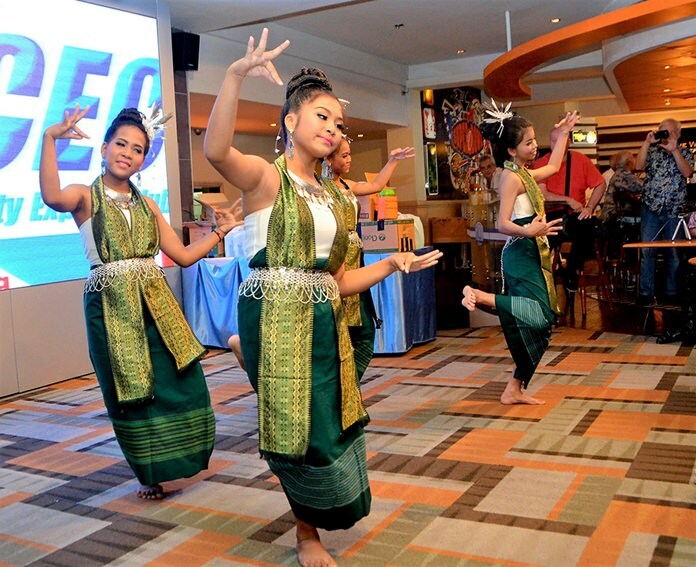 These four charming ladies in traditional costume entertained the PCEC with a classical Thai dance. 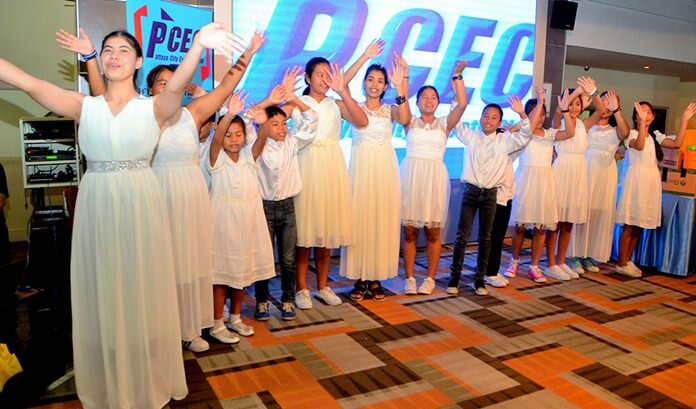 The PCEC enjoyed the singing from the CPDC children, all wearing large white gloves which they used to great effect. All the children joined in to sing “We wish you a Merry Christmas” to the delight of their PCEC audience. After the introductory dance by the children, their teacher also performed a solo classical dance for the PCEC. 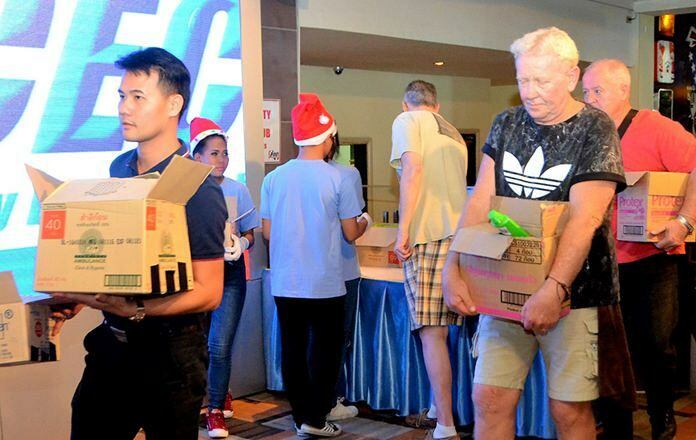 Several “strong” PCEC members assisted in carrying out the gifts for the children at the Pattaya Orphanage, which were purchased from donations received from members and guests. 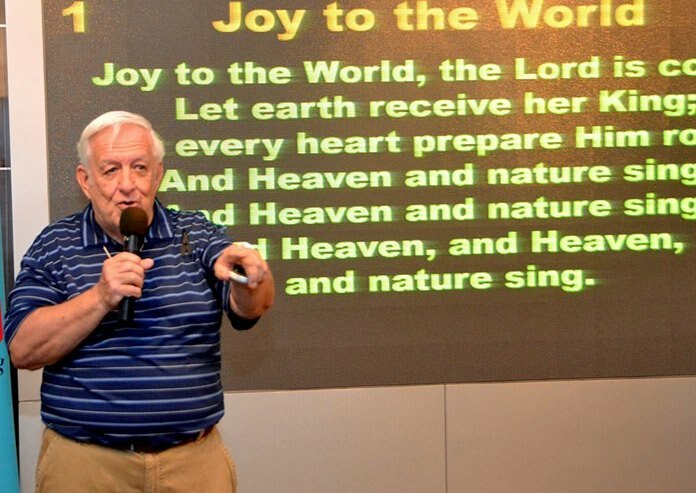 Member Roger Fox leads his fellow PCEC members and guests in singing several Christmas Carols.